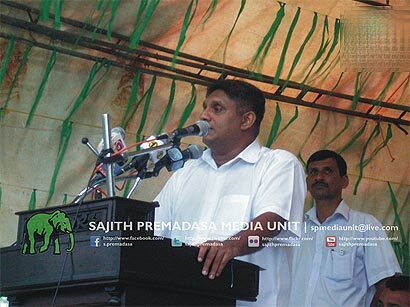 UNP parliamentarian Sajith Premadasa says that it is his ambition to take the party towards victory with everyone’s support. Everybody has to commit in order to break free from the defeated mentality and direct the UNP towards triumph, he expressed. We cannot near success by displaying our approval to all the actions taken by the party’s leadership. It can only be achieved by pointing out the weaknesses of the party leadership and thereby guiding towards the correct path, Sajith Premadasa explained speaking to the gathering at the United National Party convention today. If ever you make it can you lead country economy same as Mr. R W? your the next president in srilanka. Sajith,I am sure you will be better than the taitor Mr.RW. Sajith can be patriotic unlike the traitor RW, who should hang for high treason along with his bosom buddies, KJ, JJ, WK and CBK. I hope he would be elected UNP leader, but the old fox will not let him as he is too greedy for power. If Sajith is elected UNP leader we may have a decent opposition to prevent government excesses, corruption and waste. It is therefore healthy to have a good, responsible, opposition in Parliament. The UNP has been suffering from a severe policy bankruptcy for many years. Despite who the leader is, the party has no understanding of national, social and econmic issues facing the two nations in Sri Lanka. Mr RW claims to be an expert in international relations. But his silence on war crimes issues is disgusting. He sent his mate, the crossover King, Karuwala jayasuriya, to make a statement only to be retracted with lightening speed. The UNP provides leadership to a pack of thieves who are simply after nothing but the national wealth. So are blue brothers. There are revolutionaries amongst the sinhala leaders; eg: Dr VBK, JJ; but neither the sinhala nation nor the tamil nation needs them. The UNP is hoping to bring 1m people to Colombo on Jan 26. Well, they can bring not 1m but 20m but hat will not dislodge the Dharaneeswara Kalyani a wee bit. The Sun God’s long term strategy is certainly working well. The Sinhala nation in Sri Lanka does not have any leadership that can see beyond the present and act startegically to meet with the national aspirations of the peoples of the two nations within the island. There’s lots of turbulence within the ruling classess in the Sinhala nation. This is extremely destructive to the people of both nations. The only hope for the peace loving peoples of the two nations lie in a CBK-SF-MS triumvirate. DC as usual is blowing his trumpet for so-called Tamil ‘nation’. He is living in cloud-cockoo-land. When are you going to come down to earth, DC? Stop smoking too much ganja pipe-dreams! You are a diaspora LTTE safely ensconced in UK or wherever. SL Tamils do not want your kind of mindless eelamists who committed such horrendous war crimes and genocide against the innocent Sinhalese and Muslims. Your extremist views of Tamil eelam has been totally rejected by the majority Tamil SL citizens. You can scream and have tantrums as much as you like for a Tamil eelam for a paltry 4 million, but it will never happen, politically or militarily. DC, you and your fanatics are losers! DC is now speaking of a triumvirate of CBK-WK-MS to create a Tamil ‘nation’ for 4 million Tamils in SL with its population of 22 million. Fat chance! The people he named are traitors of SL, rejected by the majority Sri Lankans at the polls. They are also losers. They will be found guilty in due course and hung for high treason. I invite DC for the hanging party. SP’s ambition is to lead the UNP. How realistic is this? The new UNP constitution is yet not conducive to fair and free election at grass-root levels of UNP membership to elect SP as their leader. SP can dream his pipe-dream but RW will remain UNP leader for many more years, to lead UNP rump to more defeats at the polls. At the end of the UNP convention, the National Anthem was sung by some who attended. It was a shameful and embarrassing sight. The national anthem was not sung in the dignity and respect it deserved. It was sung like a baila tamasha. One party stalwart was seen beating the rhythm on the shoulders of a female member to her indignation. Some were swaying and dancing to the rhythm like a rabble. What a shameful sight! Are these the people who wants to run the country? They have no patriotic feelings. They only care to capture power by hook or by crook to enjoy luxurious life-style for the few in power, at people’s expense, while conceding eelam to extremist Tamil minority vociforous diaspora LTTE. The country will be ruined! Woe to the UNP!